Management is considered to be the process of getting planned things implemented through and with people within the available resources of the organization. Management consists of accomplishment of predetermined objectives through planning and directing of efforts and the organizing and employing of the human and material resources. Management is an approach which enables the realization of the desired results (generally expressed in terms of performance) by taking actions to achieve those results and by dealing with the dangers brought in by external and internal factors (environment) within the organization. Development of the management concepts has taken place in several stages. During these stages, different approaches for the management concepts have been developed. These stages provide the information about the approach which was predominant during the period of the stage. These management approaches have been developed and tested over time. Elements from these approaches which have been proven successful can be taken and integrated to arrive at a unified system of management practice to suit a particular situation in an organization. During the study of the stages of the management concepts, it can be seen that there is non-linearity and every stage involves active interplay of components which cannot be separated into distinct elements. Further, since there is continuous evolvement of management processes, their identification with a certain stage is a bit vague, though there are some practices which are dominating during each stage. Though, it is difficult to predict the timings for these practices, there are periods in the stage when the specific practice has been developed and applied with sufficient regularity. These regular practices of the various stages are given below. The basis of the scientific management is considered to be the work of Frederick Taylor and the period was the latter half of the nineteenth century and early period of the twentieth century. During the period, workers resisted the efforts of higher management in the direction of achieving higher productivity. Scientific studies of workers, machine and workplace were made in this stage for the determination of fair day’s work. During this period modern industrial practices of standardization of parts, uniformity of work methods, and the assembly line found their roots. A class of fundamental motions as the most basic elemental motion was developed in this period. Scientific management became an accepted, codified concept of the period and emerged the predominant approach to the management during the period. Even in the present day context, this concept continues to be the basis for continuous improvement in productivity and cost containment. Scientific management concept concentrated on the work and neglected the worker. Hence it was but natural that their needs were felt. During this stage, there was concentration on the human relation approach to the management. This approach focused primarily on the worker. A large number of studies were made on the human behaviour and how it impacts on the workers’ productivity. During the period, the importance of informal groups and the motivational and social needs of the workers were recognized. There exists a close link between human behaviour and human relation approach since both of them stress towards the social and the psychological needs of the worker and group dynamics. During the period, there was emphasis on total quality management (TQM) and quality circles. These practices indicate a highly participative style of management indicating the human relations approach of the period. Several forums were developed during the period for regular meetings between representatives of the workers and the management. Structuralism is a method of interpretation and analysis of aspects of human cognition, behaviour, culture and experience, which focuses on relationships of contrast between elements in a conceptual system. It works to uncover the structures that underlie all the things which humans do, think, perceive, and feel. Since under the management, work is done within specific organizational patterns and since worker-superior roles imply authority relationships, the structure or framework within which these patterns and relationship occur is known as structuralism. It is based on bureaucratic or formal organization and gives particular attention to line and staff relationships, authority structure, the process of decision making, and the effect of organizational life on the individual worker. In the management process approach, the different functions, which a manager performs, constitute a continuous process. The basic principles or ‘laws’ of this approach were developed by Henry Fayol (1841- 1925), but came to light only in 1939, when Mooney and Reiley published a classification and integrated analysis of the principles of management. Chester Barnard further explored the basic processes and functions of management and this included universality of these elements. Management science stage includes different quantitative approaches which is also known as quantitative or operational research. Under management science, problem solving and decision making is carried out through statistical analysis using mathematical models and with the use of probability and statistical inference. Development of mathematical models and use of computer technology for problem solving and decision making speeded up during the period of World War II and the era of space exploration. This stage is also characterized by an interdisciplinary approach. Example of management science application includes use of Six-Sigma method for the analysis of organizational performance. Six-Sigma which is a continuous improvement tool relies on the statistical analysis. Each of the above five stages of management concepts namely (i) scientific management, (ii) human behaviour and human relation approach, (iii) structuralism, (iv) management process, and (v) management science has emphasized one major feature of the organization. Hence, there arose a need of the management method which takes into account these five essential features of the management and this led to the stage of the system approach. System approach to management concentrates on the organization as a whole which includes (i) the internal and external components, (ii) people working in the organization, (iii) work processes of the organization, and (iv) overall environment under which the organization is functioning. Stage of system approach to management makes use of computer technology and provides the manager a framework within which internal and external factors influencing the decision making can be visualized. System approach to the management emphasizes total environment under which the organization is functioning. In system approach to management, the management cycle consists of input, transformation to output, and renewed input. During the management cycle, environment changes are assessed continually in a structured manner for the determination of their impact. System approach to management considers organization as a total system where a change in any one aspect of the environment has an effect on the other components of the organization. In this approach, the specifics are analyzed considering the complete organizational environment. The whole organization is considered as one entity which functions in a specific environment where essential parts are interdependent. General system theory as a concept was introduced and defined during 1951. This theory laid the foundations for the basic concepts of the general system theory. After this, a hierarchy of systems to help bridge the gap between theoretical and empirical systems knowledge was developed. In this hierarchy of systems, the concept of the open system and the idea of social organization with role sets are included. This has provided a framework for the development of the analytical model. Application of system model theory is done in several management areas which includes the following. Data processing system – It is used to guide the flow of information, normally utilizing the computer technology. Administrative system – This includes planned approach to activities necessary to achieve the desired objectives. Cybernetics – It is the science of communication and control. Network analysis – It is the process of planning and scheduling. Examples are PERT (programme evaluation and review technique) and CPM (critical path method). Rhochrematics – It is the science of material flow and includes production and marketing, transportation, processing, handling, storing and distribution of materials. A system is defined as a collection or a compilation of parts or things forming a complex or unitary whole, a set of interacting units. The necessary emphasis in this approach to management is the interdependence and relationship of the parts. This approach moves beyond structure or functions (e.g. departments, and organization charts etc.) and focuses on the information flow, the work, the input, and the output. This approach shows importance of horizontal relationship in addition to the vertical relationship. 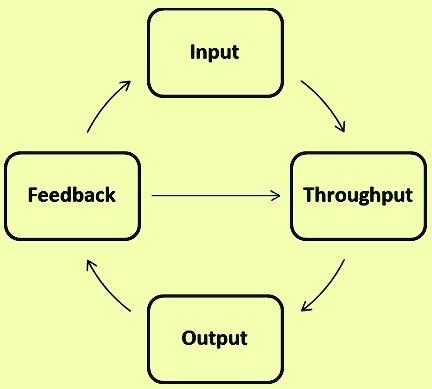 The model used in the system approach to management (Fig 1) has four components namely (i) input, (ii) throughput consisting of process, (iii) output, and (iv) feedback. In this approach to management the environment under which these four components are functioning need to be considered. Inputs – Inputs to the system are provided by the outside forces and they normally consist of those elements which are accepted by the system. Some of the inputs imposed from outside such as regulatory and economic factors can put restriction on the processes (throughput). Certain inputs are essential for the achieving the output. Examples are raw materials, human resource, and equipment etc. The concept of input can be expanded to include the demands made on the system (e.g. priorities, deadlines, or conflicting pressures). Inputs can also include goodwill and general support or absence of these. Outputs – They are the goods and services which are produced by the organization or its departments or units. Outputs can be routine, easy to identify, predictable, and frequent. The stated purpose of the organization or its departments or units is to provide its basic output. The outputs are controlled by the managers through the planning process. Some of the outputs are predictable but not regular. These irregular outputs can be known by carefully analyzing organizational data over a relatively long time period. Identification and anticipation of these irregular outputs helps the planning process to meet the periodic demands on the system due to these outputs which in turn helps in stability of the organization. Further there can be irregular and non-predictable outputs (e.g. windstorm, gale, and accidents etc. ), which are required to be planned so that the demands on the system are met. For planning and controlling these demands on the system, realistic estimates are usually made. Also, some unforeseen outputs take place because of natural disasters or sudden economic turmoil. Even for such instances, managers can estimate and plan for anticipated destruction. Disaster planning is done in such cases. It is always useful to group the outputs with the associated inputs by formulating input/output statements. However, one is to know that not every input generates a direct output and there is no one to one relationship between input and output. There can be a number of inputs needed for one output. Throughputs – They are the processes or structures through which inputs are converted into output. Throughputs can consist of methods, procedures, work flows or physical plants. Unlike inputs which originate in the organizational environment, throughputs are contained within the organization. Throughputs can be analyzed by physical layout analysis, staffing patterns, work simplifications, work sampling and methods improvement. There can be severe limitation on part of the managers to control the inputs, but the processes, procedures, organizational patterns, and structures which constitute the throughputs are usually areas of management control. In some cases, some of the components theoretically belonging to the throughput category are considered inputs. These are the components which are imposed by the organizational environment. Examples of these components are shortage of budget provisions, manpower shortage, and space limitation etc. Managers are normally not able to exert direct control on these components. Feedback – Managers need feedbacks on the adequacy as well as adaptability of the outputs especially when some changes take place in the inputs. It is through the feedbacks, adjustments are made in the inputs and throughputs to achieve the desired output. Organized feedbacks are usually provided through communication network and control processes. Examples of the processes for routine feedbacks are activities related to market research and forecasting, customer’s surveys, employee’s satisfaction surveys, different types of audits, periodic inspection and testing of the output, and employees’ appraisal system etc. The processes of management by objectives (MBO), short interval scheduling, PERT networks comprise some of the management tools for planning and controlling the structured factual feedback. In case, there is absence of planned feedback, then the feedback usually take a negative form for the organization. Absence or insufficient planned feedback is due to (i) if the communication process is not developed to permit safe avenues for the feedback, or (ii) if the feedback actually received is ignored. In case of ignorance of feedback, a certain amount of feedback occurs spontaneously. Some of the feedbacks is tacit. In such a case the manager assumes that since there is no evidence to the contrary, all the outputs are normal. However, there is danger in such type of assumption, since the problems may not come to the surface until there is a crisis. The planning process is undermined since there are no reliable data which can be used to assess the impact of change and to implement the necessary adjustments in the inputs and the throuhputs. Systems can be classified as closed system or open system. An ideal closed system is complete in itself. This means that (i) there are no new inputs which are received, (ii) there is no change in the components, and (iii) there is no output of energy in any of its forms. A few response or adaption in the systems can be required since a closed system is normally isolated from external forces in its environment and internal changes are self-adjusting. Organizations are viewed as closed systems in certain approaches to the organization theory. This means that the importance is given on the study of functions and structures within the organization without any consideration of its environment and the resultant effect of environmental change on its processes. An open system experiences a constant state of flux. There are continuous flow of inputs and outflow of outputs. There is input and output of both matter and energy, continual adaption to the environment, and generally an increase of order and complexity, with differentiation of parts over time. The open system constantly seeks internal balance or homeostasis (the tendency towards a relatively stable equilibrium between interdependent elements, especially as maintained by physiological processes) by means of an adjustive function of stimulus-response. A change in the organizational environment (stimulus) makes it necessary to take some action (response) for the maintenance of this balance. The following three processes are normally necessary for a system to maintain this self-regulating cycle. Detection process – The disparity between the disturbed and the desired (normal) state is to be detectable for the regulation to take place. Obviously, without knowing the disturbance, measures cannot be taken for its correction. Also, it is also an apparent fact that individuals vary in both the quality and quantity of information which is needed by them for the detection of a disturbance. Identification process – It is necessary to identify the disparity. Corrective action cannot be specific unless a given disturbance is successfully differentiated from the other possible disturbances. Here again, there exists undoubtedly the individual differences in the form and quantity of the information needed. Availability of response – After the detection and identification of the disturbance, environmental and physiological conditions are to be available in the organization for making the correction. In the open system, the adjustment to the change in the environment is made through the input-output cycle and the development of the proper feedback mechanism. Another important function of the management is the systematically monitoring of the change. The management functions of decision making, leadership, and, particularly, corrective actions for the deviation from the organizational objectives are necessary for the detection, identification, and appropriate response for changes in the organizational environment. All the organizational situations have the capacities for achieving the maximum deviations from the normal after which the disintegration takes place. The tendency towards disintegration is termed as entropy. The open system is characterized by the continuous striving for negative entropy to overcome disintegration by taking into itself higher inputs than normal (i.e. whatever it needs to produce the required outputs). Hence an organization is required to have a reserve of resources to protect it during the potential difficult situations. The system approach helps the management to focus on the organization as a whole and to view each department or unit in the organization in relation to the whole. Through the system approach, managers can cut across the organizational lines to determine inter-relationships in the workflow and to assess the complexities in the structure and the environment of the organization. They are also able to know the changes in the environment which are affecting the organization and its departments. Managers are assisted in their analysis of the organization since the input-throughput- output model removes any personal bias toward or attachment to the existing mode of operations. Moreover, the traditional functions of a manager, which are carried out in the distinct, unique environment of a given organization, are reflected in the systems approach to management. The inter-relationship is given in Tab 1. An organization does not exist in a static environment. In fact, it is continuously in the state of interaction with its environment. Successful organizational management recognizes the impact of the organizational environment on the employees, customers and other stakeholders, as well as on the specific role of the management. As an open system, the organization receives the inputs from its environment and acts upon them and is acted on by them for producing the outputs. Outputs have a wide range. Even the survival of the organization can also be considered as an important output. Hence the environment of the organization has both internal and external components. The specifics functions of the managers are adjusted by the organizational environment. Traditional organization theory provides the manager with concepts to assess the organizational environment. The environment of the organization is generally assessed by (i) examining its features and components through a typology of the organization, (ii) a review of the life cycle of the organization, and (iii) an analysis of the purpose and functions of the organization. The use of customers’ network and systems models yields further information about the internal and external components of the organizational environment. Managers can anticipate conflicts in the organization when the stated purposes or goals differ with actual practices. Such incidences taking place in the organization alert the managers to the changes in the organizational environment for them to develop an anticipatory response in place of a reactive response.